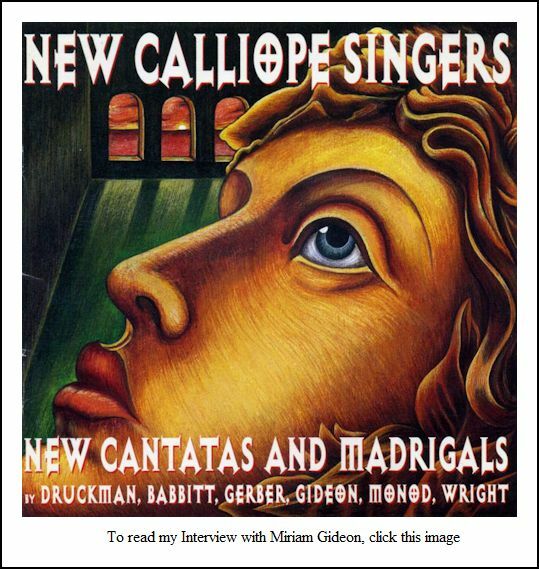 Maurice Wright Interview with Bruce Duffie . . . . . .
Maurice Wright was born in 1949 in Front Royal, Virginia, a small town situated between the forks of the Shenandoah River and near the Blue Ridge Mountains; he began composing at age 10. He attended Duke University and Columbia University, where he explored diverse interests that included music composition, computer science and film. He has been commissioned by outstanding ensembles and soloists across the United States, including the Boston Symphony Orchestra, the Emerson String Quartet, the American Brass Quintet, the Riverside Symphony, and the Berkshire Music Festival at Tanglewood. The American Academy of Arts and Letters, the Guggenheim Foundation, the Fromm Music Foundation, the National Endowment for the Arts, and the Pennsylvania Council on the Arts have recognized and supported his work. Six CD recordings on New World, Innova and CRI include his compositions. 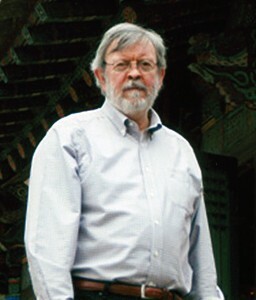 Wright has taught at Boston University, Columbia University, and the University of Pennsylvania. He is Laura H. Carnell Professor of Music Composition at Temple University's Boyer College Of Music and Dance, where he co-founded the Interactive Arts and Technology Laboratory and the Presser Center for Creative Music Technology. He recently served as Interim Associate Dean for Graduate Programs, Financial Aid and Technology. Wright was introduced to the craft and technology of film when he met Director Gene Searchinger in 1976 and contributed an electronic score for an unusual film about recycled aluminum, "Metallic Tales: The Social Life of a Non-Ferrous Metal," which received a Golden Eagle Award. Over the next two decades Wright continued to work with Searchinger, most recently contributing music and special sound for the three-program series about linguistics, "The Human Language," broadcast in the United States and Japan. 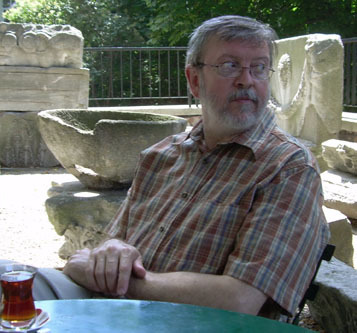 His interests in image were incorporated into two electronic operas: The Trojan Conflict (1989), and Dr. Franklin, an opera about Benjamin Franklin, produced in Philadelphia in 1990 as part of the Electrical Matter Festival. In both works a video screen was embedded in the set, and short scenes written and directed by Wright were integrated into the operatic fabric. Since then he has experimented with visualization of musical sound and with digital animation, making his first professional presentation as an animator in March, 1996. Shortly thereafter he was commissioned by the Network for New Music to create a work for computer animation and computer sound for their 1996-1997 season in Philadelphia. 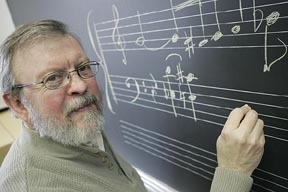 The resulting work, "Taylor Series," was described in the Philadelphia Inquirer as "visionary" and "lyric." 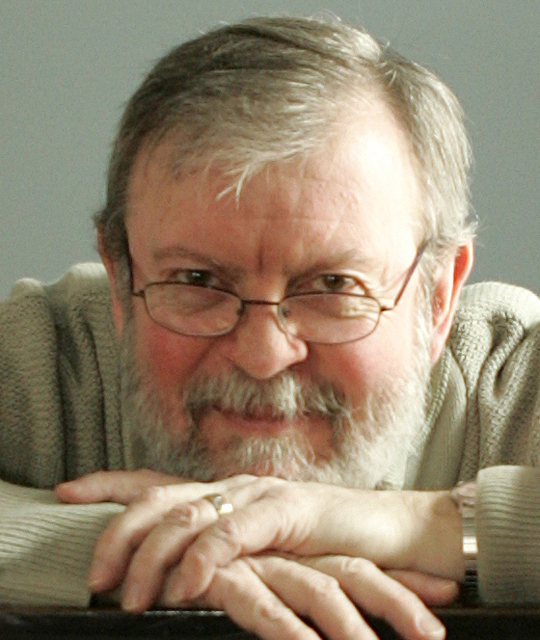 Wright is currently setting the poetry of the late William F. Van Wert, a Temple colleague whose work Wright first incorporated in The Lyric's Tale, "an entertainment" for baritone voice, actress, chamber orchestra and projected video, that plays themes of religion, existentialism and science against one another in a fast-paced, 45 minute work featuring dozens of characters, including Galileo, Sigmund Freud and Martin Luther. For more information, visit Wright's official website. In September of 1994, Maurice Wright was in Chicago, and I had the chance to sit down with him for the conversation reproduced below. Portions were used a couple of times on WNIB. In 2011, when getting the interview ready for presentation on this website, it was particularly interesting to see how the two of us chatted in very primitive terms about the then-early-days of electronic manipulation, and the possibilities of the internet. Utilizing the internet now, names which are links throughout this webpage refer to my Interviews elsewhere on my website! Here is that wide-ranging discussion . . . . .
Bruce Duffie: In looking over the material which you sent, I see you were made full professor. Are you a little young to be a full professor, or is this about the right time for it? 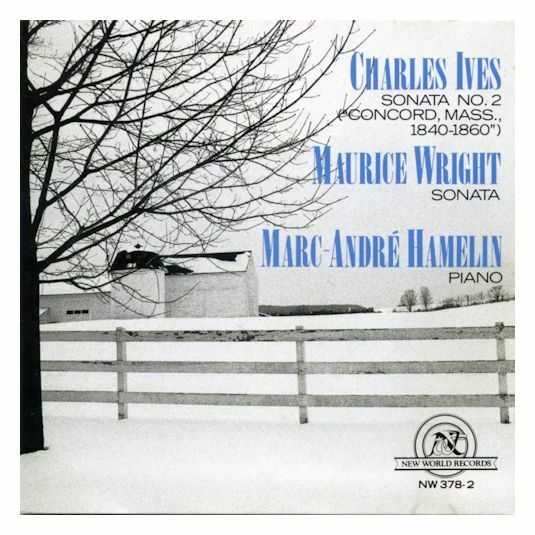 Maurice Wright: It’s a perfect time for me. At the institution, maybe I am a little young, but I’ve been at Temple University since 1980, and was made full professor in 1992. So I guess about it is not extraordinarily young, but I was very happy for that. It’s the last big peer review that way. I’m a department chair. Even though it’s a very small department, Composition in a music school is looked upon for a lot of services. In addition to training composers, we’re expected to keep nudging the other ensembles to perform interesting repertory, and to keep track of what goes on. So I stay busy with that. I like the music school a lot, and have wanted to be in the university for as long as I remember. I’ve never seen it as a bad second choice, as some composers talk about. I like it there a lot, and probably will stay at Temple for the next several decades. BD: You’re not only teaching, you also have the responsibilities of the chairmanship of the department. Do you get enough time to compose? MW: Well, it’s very tight. One of the good things about being chair is you set all the teaching schedules — including your own — so there’s a way to streamline it to allow some latitude. But it’s very tight. The summers are really treasured because they’re the longest unbroken stretches of time. During the year, one simply has to scramble around to find activities that can be done in spurts instead of over long stretches of time. BD: When you’re organizing your compositional process, do you know that some things can be done during the year, so you let them go until later, like copying or scoring, rather than original composition? MW: To some extent, although the real world seldom cooperates to make it that neat. But I do know that if there’s a big project, and if I can wait to start it in the summer or in late spring, it’s better than if I try to begin it in the heart of the concert season and the heart of the academic year, all at the same time. BD: Are there times, though, that you get an idea and you say, “I’ve really got to work on that”? MW: Then you go right to it and write it down. I have a fair amount of time along with a teaching schedule. Even though there are activities seven days a week at the university, classes are scheduled with faculty on basically three of those seven days, so there are many times when I can have a day during the week which is completely unstructured and unfettered. And I can get a lot done in a day. If you can get up a head of steam with things, the inertia will carry through a lot of difficult situations. I know from people that I’ve talked to who have studied or taught at Eastman, that the composer Joe Schwanter carries manuscript with him everyplace. Whenever he has five minutes, he takes out a piece of paper and goes right back to work. He almost never stops. I haven’t gotten to that point, but you can do it if you have the piece started. But the starting time is critical. Things have to be right to get it started, and after that you can go. BD: I assume that you carry a memory chip in your head. Do you use little “five minuteses” to work from that memory chip? MW: Sometimes when I’m in a situation where the things going on are not interesting and I can’t escape, I will draw very small staff lines in the corner of a piece of paper, and just try arranging notes and working with things a little bit to that extent. You can kind of sneak work in any place, but really, I find that the best work is done in one’s own place. Whatever studio’s been set aside as the place where you’re most comfortable to go, that’s where I like to go. BD: If you’re in the midst of a piece and you’ve got ideas, do you find that even if you don’t get to that piece of paper for a couple of days, that when you come back to it the things have steeped in your mind and they come out more easily? MW: To some extent I think that’s true, but that looks at another part of composer-technique, which is how you use the overnight period. One of my teachers at Columbia was Jack Beeson, who has composed some of the sweetest melodies in the late twentieth century. This was during the time when Columbia had a reputation for being full of strict serialists, and there I was studying with Jack, who was writing Captain Jinks of the Horse Marines, which is full of 1890’s musical tunes. He always said that if you reached a problem that was absolutely insoluble, the trick was to put it very clearly to yourself and then go to sleep. It would always be solved in the morning because the sleeping process and the time process will usually answer things — as long as it’s only two days. If it goes for more days, then one starts losing the thread, and that will kind of push the idea out. But overnight or a day or two is fine, as long as waiting a day or so doesn’t mean that one has to rush later on. That’s a big problem. But when waiting a day or so, ideas do develop to a certain extent. You don’t lose anything in a few days. BD: When you sit down to write a piece, do you know about how long the compositional process will take? MW: If it’s left completely to me, perhaps I’d know, or perhaps I’d have a schedule. It sometimes happens that there is a performance in mind. I like writing pieces when there’s a performance in mind, because it helps for me to visualize the players with their instruments playing the note as I put it down. I can somehow imagine just what a person will look like, or what kind of body movement will happen, and in a flash I’ll have an image which is fairly clear, just what it will look like and what it will sound like. This is useful. But the cost of writing for a performance is that it comes up at a specific time. Sometimes one finds one’s self saying, “Is it realistic to commit to having this piece finished in three months, or in two months?” That’s when you really have to look at whether you’re writing it during the year, when there are lots of other activities, or during a time when you’re really free of interruption — whatever that actually means, I’m not sure — but at a time when you have a lot of free time. So I can kind of plan, and I find that no matter how I plan, I can always finish the piece within one week after I thought I could. It always takes that length of time past the deadline, and that has to be built into the deadline. The deadline process has to include the extra week that it takes. I’ll set in my head; otherwise I just can’t do it. But it really helps. I like being able to come to closure knowing that there’s a date on the calendar at which something will be at this stage or at that stage, and most often that works. BD: When you’re working on the piece and you have, say, three months plus that extra week, is most of your work done during the three months, or is most of the work done in that last week or so? MW: The deadline artist puts it off for as long as they can, and then starts. I have to work at a fairly regular pace to accomplish a lot. It takes a very long time for me to write a piece. There may be people who are much better at doing it quickly, but it takes me a long time. If I don’t plan to spend a lot of time, it just won’t work out and I won’t get to the point that I want to get. So, I watch the calendar and I watch the clock a little bit, and work through the piece. There’s a sense of how it will turn out. One way of thinking about this is that the longer you put off beginning the piece or working on the piece, the more chances you have to roll the ideas around; the more the subconscious and the unconscious have a chance to make something in there that you don’t know about yet. The longer you leave that, perhaps the better it will turn out. On the other hand, it’s also like something that you’re preserving; if you’re cooking something, you can leave it for a certain time until it’s just right, but after a while it doesn’t do any good. You can’t rush the composing process. It really takes that much time to get the notes down, whether you use a pencil and paper or a computer or a quill or whatever. It’s just a very long process of putting notes down, even at the fastest speed that you can write. MW: It’s a question that many people ask. Many of my composition students do this, and have been doing it for years. I’ve been very critical because often the notation doesn’t look right. Some conductors complain about the way it looks, and there are a lot of problems to be solved. For many people, or for a certain sort of person, computers are a lot of fun to use. You can find yourself having a really great time fiddling with your computer and not necessarily producing the kind of notation that you need. However, recently I’ve given into it because one has to come to grips with the fact that the engraved scores are useful in many ways, and if it’s done carefully, it can be a very beautiful result. So I’ve started with it, but I don’t like to compose near a computer. I would engrave a piece using the computer if I had the time, but I don’t think I’d want to compose with it at this point. BD: When you’re working with a piece and you’ve got all of the notes down, you’re looking at it and revising and tinkering, aside from the actual deadline, how do you know when you have actually finished the piece? MW: When I’m working on the piece, there’s a sense for about two-thirds of the work process where I’m thinking about what will happen next in this section or the section after that; how the sections will fit together. Basically I am thinking about what a problem it’s going to be to make the structure work, or how challenging it will be to make the ending interesting after so many things have gone on. Then one day — it always happens — one has the sense that it will be nice when this piece is over because the next piece has potential for something that you can’t exercise in this one. It’s usually somewhere at the sixty-six to seventy-five percent mark, and it marks the beginning of the completion. If you do it enough, you start to recognize those signs. You start to recognize that day when it comes. MW: Yeah. I’m thinking about the next piece! Then it must be time to end. When that happens, the tension of the piece tends to disperse a little bit; things lighten up and the piece releases itself to the end. It’s kind of colorful language, but it really does feel that way when you reach that time. BD: Throughout the compositional process, are there times when the pencil controls your hand, or are you always in control of where those notes go on the page? MW: If one pushes, if you try to work all night long or if you try to work for great lengths of time, it can get into kind of an automatic writing phase. One has to know when to stop. I will start to make small mistakes before I get quite to that level of fatigue. I’ll find myself writing a note or two in the wrong clef or a beat will be missing, or something will just be wrong. That’s usually a sign that the focus is not what it was an hour ago, and it’s time to walk away from it. If the work period goes past a certain point, then the worst things occur. When I was in my twenties, I could work late at night; I could work all night and do all sorts of things. Without saying whether the pieces were good or bad, I know that I felt as if I was engaged at the same level. Now I’m better in the morning, and for actually composing I am limited to maybe a six hour stretch at the very outside; closer to four. Then something mechanical can fill up any length of time — engraving or copying or editing or something like that. BD: Not specifically about fatigue, but when you’re working — even at your height — are you ever surprised by what you find has come onto the page? MW: Yes, and that surprise comes from the fact that I can’t really say that I can plan a whole piece from the beginning, nor that at the outset I know that this will be a section and this will be an idea. I’m just not that confident that I know where the thing is going to go. So it gets started and then I follow along with it as best I can. Or, I’ll have an idea, and that will involve inventing a little mechanism to get the idea to have some real substance to it. Once it starts to churn along, it will usually transcend the mechanism. Hopefully the idea still stays there, but the mechanism that you use to get the idea into real form can get lost. Perhaps that’s what you’re asking about — does it get beyond a kind of logical, directed activity, into something which probably integrates more parts of the thinking and feeling process. BD: When you’re involved with the compositional process, are you aware of either the audience that will be listening to it or the performers who will be playing it? MW: Again, it’s more an image. I finished a piece this summer that I was writing for the K. L. R. Trio. Not to drop names, but this is a wonderful trio. MW: Exactly. I had been to see them most recently in December, and as I was writing for them, I could imagine just the way I remembered them looking when they played Mendelssohn or Kirchner, which are the two pieces I heard on their program. What that means I’m not sure, but yes, I would put some notes for the cello or the violin and could imagine just what they would look like. One of the things that (violinist) Jaime Laredo does, which is so beautiful in performance and results in some of the most beautiful music he makes, is done by drawing away from the climactic note. It’s what he doesn’t do which is really quite beautiful. It is very subdued, very restrained, and I found myself trying to get that motion somehow in my writing, or in the pencil, for a lack of a better place to put it. I could imagine that maybe this would be a spot where somebody might find it a propos to pull back before they went to the note that was at the peak of the phrase. I think about the audiences, I suppose, but I don’t really picture them the same way. 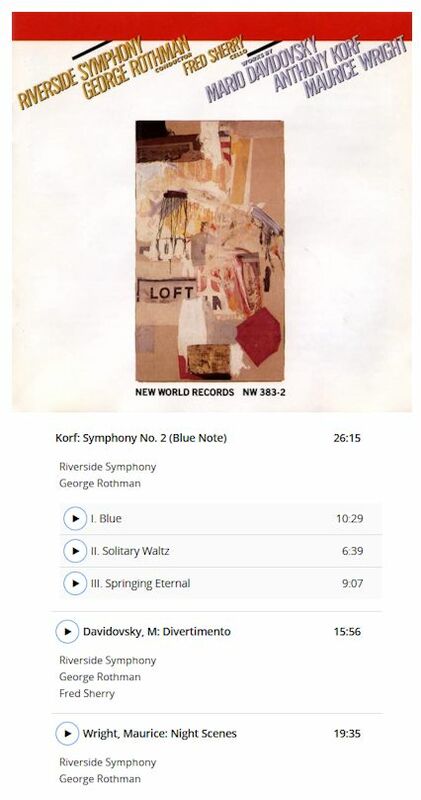 I was sitting with in the Ninety-Second Street Y for that concert, but I don’t remember; I can’t imagine what they would think, listening to the piece. So I guess I focus more on the performers, in terms of actual images, when I’m writing. BD: Regarding this idea of pulling away from a note, don’t you feel that you are kind of inhibiting his freedom to do that on his own? MW: I thought about that, too! I thought that what I had to do was write something where the obvious way to play it would be to go straight to the note so that there’d be room to pull back. I didn’t want to write in the pulling backs, but I imagined that some phrases, if I made them direct enough, he would perhaps want to transform them in the way that I’ve heard him. So I wanted to be careful to leave room in the lines for the players to do things with them. (Pianist) Kalichstein is absolutely remarkable with terraced dynamics. You can hear the mezzo piano and the piano and the pianissimo and the poco forte. You can hear maybe thirteen or fourteen levels! One tends to think about dynamics differently when I know that he’s going to look at it and analyze it and make that kind of terraced approach to the dynamics. What do you write — do you write twelve dynamics? I don’t think so. I tended to write pretty much piano and forte, with a few other gradations, hoping that the rest of the context would be pulled out of his imagination to play it. I try to make it clear, and yet leave enough room so that this ought to be a natural thing. It’s not such a technical process of delivering data to people. I try to find a balance between them. BD: How much leeway do you leave for the performers, whether it be the special trio or just whoever happens to buy the score? MW: In my pieces there are more dynamic marks and articulation marks than there would be in a nineteenth century work, to be sure. But by twentieth century standards, some of the pages seem relatively spare. I don’t know if I’ve answered the question in terms of what this means to other performers, but really, every performer brings something interesting to a piece. And those who aren’t good performers don’t tend to be playing lots of really difficult pieces in public many times anyway, so there’s nothing much to worry about. [Both laugh] I don’t feel that it’s really necessary to worry too much about that, although perhaps you’ve gotten me started! BD: [With a mixture of mock horror and genuine concern] Oh, dear! MW: [Laughs] I’ll go back and make another edition! BD: Have you basically been pleased with the performances you’ve heard of your works over the years? MW: Very funny things happen in performance. I find that the assumption is that when a composer goes to a rehearsal, he or she will hear every note that’s played and immediately be able to tell if it’s what they intended or not. Thus their experience and their participation will help refine the piece, and at the end they’ll have a performance. I find that when I hear a rehearsal, or even a performance, I’m continually going back and reliving the process of writing the notes, or even second-guessing some of my choices. Not that I change much, but I go back and listen to it again. So in rehearsals, I’m often a measure behind where anyone is, thinking about something else that I’ve just heard, and not being a lot of use, really. So I’m most pleased with performances where there’s a kind of good feeling amongst the performers, but I guess I’m more pleased still when it’s music that I like to replay in my head and hear myself a lot. There have been a lot of performances that have pleased me a lot, and I don’t think it’s because I have lax standards. I just think that it really is a very enjoyable process for me. I feel very fortunate to have been performed by some of the people that I’ve run into, and very pleased to be there, very happy to be involved in some way. MW: Yeah, there are times when it’s really just awful! BD: I meant either good or bad. MW: Oh. [Pauses a moment] Usually, just awful, I think. If it sounds really good, I assume that I put it there, and if there’s something wrong with it, someone must have played it wrong! I guess that’s a natural function of the ego that keeps you falling forward instead of falling back in these things. But sometimes there are big variations from what I put there and what I heard and what I thought it would here. But this is not endemic; it doesn’t happen every time that there’s a piece, or every time there’s a performance. BD: Do you find it happens less often if there’s a recording to study? MW: Of the pieces that I have recorded, I don’t know how many subsequent performances there have been that would have been really significantly affected by the recordings. There’s a piece for piano and electronic sound that I wrote a long time ago, maybe twenty years ago, that’s been performed and recorded and recorded again. 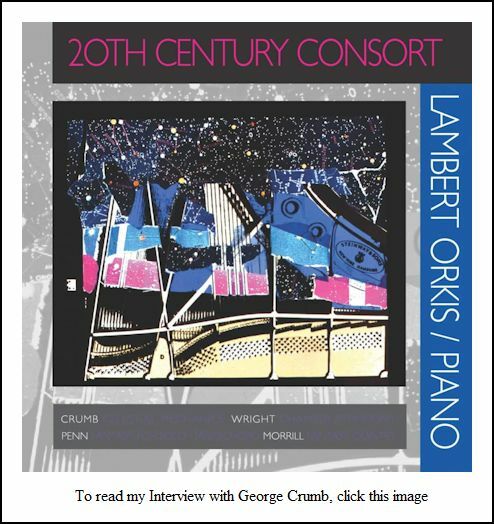 So that’s a piece where pianists have listened to the recordings and they’ll tell me what they think about them, or basically they’ll say what they’re going to do that’s different. In solo music, rather than copying a recording, the players will figure out what they’re going to do that really will make their performance a different one from the one that’s there. MW: It’s very interesting to watch. 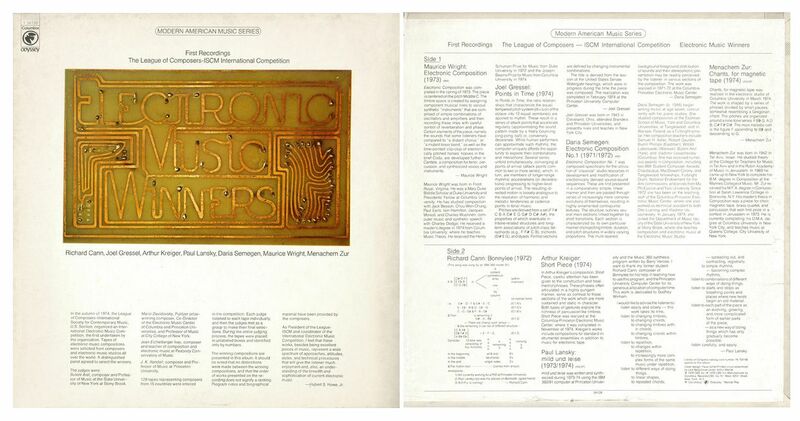 The piece for piano and electronic sound that I’m referring to, Lambert Orkis recorded in the middle seventies in the Library of Congress Auditorium. There was some noise in the hall; oddly enough, there was a big banquet that was organized by Committee on World Hunger, and they were whooping it up upstairs. This would come through as we were down in the auditorium. The electronic sounds were played back through loudspeakers into the room and were picked up by the same microphones that picked up the piano. This gave it a rich, swirling effect. So when that piece was re-recorded, the pianist said it would really be interesting to hear it where the sounds were close up on the same level as the piano. In some ways it’s really a different sound because the first one reproduces the effect that you had in a recital hall. The second one is more draws more attention to technology because you hear the electronic sounds without any acoustical ambiance, which means they can be in very odd left-right positions. Kind of strange, echo-y, non-echo-y things could occur one right after the other. It was a very interesting recording. I’m not sure which is better; I don’t prefer one to the other. They’re both interesting, I think. Hopefully one makes a second recording because there’s a different way to do it than the first one. We don’t just all record the same pieces the same way over and over because we can. But then, I’m not speaking as performer, so I don’t know. My suspicion is that that is what happens. [Both laugh] Just keep doing the same things! BD: In standard repertoire, I’m afraid that’s what happens for the umpteenth recording of this or that. MW: In the standard repertory it’s interesting, though. CDs have been such a boon because you have to re-record everything to get it into that format. Then, of course, with debates about original instrument performances and the interest in a different kind of orchestral sound, there are even more reasons to re-record certain parts of the repertory all different ways. I find it really interesting; I really like hearing Berlioz with a different set of instruments and some strange tempi. I don’t know if I’d want to hear it more than once, but I always rush to hear the recordings that are a little bit out of the mainstream framework. With music of this century, though, it’s hard to know what it means to make multiple recordings of a piece, because you should know, most all the way along, about how the piece ought to go. The composer is usually around to say it should go this way or that way, so the leeway for making great differences in recordings, I think, is less. BD: [With mock horror] You mean you and your fellow composers are inhibiting the process? BD: Then let’s look even beyond this. Say a hundred years from now they’re getting together a performance of one of your pieces. If they have a composer-authorized, or a composer-supervised, or perhaps even a composer-conducted recording, should they say, “It has to be that way.” Suppose we had Beethoven-conducted recordings? We’d be doing it his way forever! MW: We have that now with recordings Stravinsky conducted, or Copland or a number of other composers. I don’t know what will happen in a hundred years. It’s likely that there are some composers who were absolutely masterful, and whether they were composing or conducting, they would have done the very best possible thing that could have been done. So those recordings should be treated as absolute doctrine. And there are other composers who perhaps, like me, are lost someplace in the process of thinking about what it was like when they wrote the piece. They may have supervised the recordings, and that may be useful but it may be that a performer with a certain sort of analytical bent will find a way to improve on a recording. It’s somewhat egotistical, though, to imagine a hundred years from now someone will care! [Laughs] Let’s hope they do! BD: [With a gentle nudge] You don’t assume that your music is being consigned to the trash heap? MW: No, definitely not. You always look on the bright side and move ahead. But it’s awfully dangerous to start imagining what history might do because there’s no end to the amount of energy and thought that can go into that. You have to kind of ignore that, I think. BD: For instance, we’re into this big “original instrument” boom. A hundred years from now they should have some kind of new piano. We almost have that now with the Disklavier. Do you want your piano pieces played on the newest instruments, or do you want them on original Steinways? MW: [Laughs] What a great question! Who knows what it would mean to the listeners in a hundred years? Composers’ heirs and publishers will be happy for anything that keeps the music in circulation somehow, as long as it’s not being abridged or changed in some substantive way. If there’s a time when they think that using modern instruments gives a better effect, then undoubtedly that will be what happens for a while; then there’ll be a time when one will want to go back and re-examine an original source, and this will hold people’s attention. It’s really a function of the time as to what people need, whether you need to feel that you’re moving ahead in a way that’s more modern, and that progress has a certain kind of tangible meaning. There are other times when reflection is much more important, and within reflection I would include scholarly research and this way of looking back to origins. But I think that both will be a function of the culture at the time. Since music has some function to provide to people who are interested in it, the needs of the aggregate of listeners at any one time will determine which of those roads we tend to go down. What’s really happened is we’re moving to the decision of will. Do we accept recordings on electronic instruments in lieu of acoustic ones? Not yet, but I’m sure we might in twenty years. With the Disklavier and the automated pianos, we’re close to that. It’s very tempting to do concert recording, where instead of recording for fifteen hours in a room that is acoustically pretty good on an instrument that’s pretty good, and having all these tapes that you take back and edit at great expense, you record on an instrument that’s pretty good and you edit the tapes very cheaply, and then take them to a very good concert hall where there’s a very good computer instrument, and you play back the data one time with all the machines running. You get an edit-free, digital recording of the perfect place, and you’ve only booked maybe two hours in this great room! [Both laugh] You can see how it would be tempting to someone who’s pressed to do the very most with the least; they’ll be looking at technology that way. BD: How much of the human-ness do we lose in all this? MW: I think it has to do with where people put their foot down. For instance, recording a piece under tempo is not legal. It would be very feasible to do the Butterfly Etude just a couple of notches below where it would be, and play it back. It will be more sparkling at a higher speed, but that is probably not the way to do things. And you can go through and remove individual wrong notes, but I don’t know. What do we all collectively think about Glenn Gould’s Bach recordings where he multi-tracked fugues? I don’t know. I saw the movie Thirty-Two Short Films, and I think he’s great. What an unusual thinker. If Glenn Gould, or the next incarnation of Glenn Gould, is fiddling with digital piano recordings, something great might happen. However, a lot of people press to make a five dollar lunch for four dollars, and that it’s not going to be so good. BD: Is it different to you, knowing that people will be listening individually in their living rooms or on headsets, rather than in a concert hall amongst two thousand people? MW: Oh, it’s a huge difference. It really permeates a lot of the thinking in contemporary music circles, especially in those pieces which are being done now with digital synthesis. I follow computer composition. I teach courses in that subject at Temple, and read the journals fiddle with it, too. A simple question that comes up when you’re doing a piece in which you are synthesizing the sounds, is do you also get to synthesize the ambient quality of the sound? Do you make the piece so that when it’s played back on a CD in someone’s living room, it has a great, warm, reverberant sound the way it might have in a concert hall, or do you make it come out some other way? If the piece is going to be played onstage with musicians, it needs to be very dry or else it will sound as if it’s coming from some farther recess of the room than the musicians that play their acoustic instruments. MW: Right, and also how you would position the pitches and durations in a synthetic space. When one works with synthesized sound, it’s an integrative process. Is this note, which is prominent, dry and close up and something that seems to be right in front of you? Should these other sounds, which are representing a different level to the piece altogether, seem distant and vague and vaporous? BD: On something like this, perhaps you could build that into the compact disk that is available. If you would like to hear it in an outdoor concert, such as at Ravinia or Tanglewood, use certain tracks; if you want to hear it in a very small hall, use other tracks. 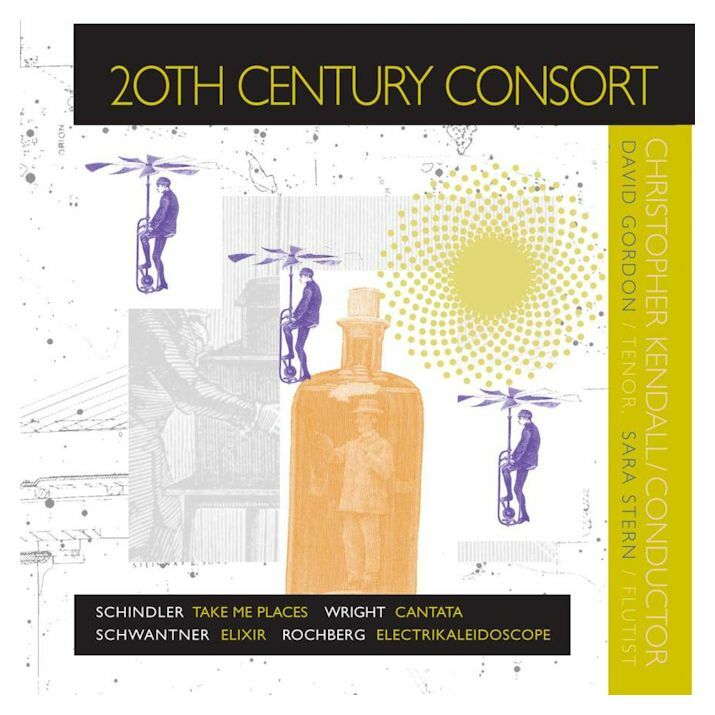 The composer can use different ambient qualities so that the listener can become an armchair conductor. MW: I think that’s very astute. There have been different hi-fi gadgets that presume to give you the sound of one concert hall or another, but unless the material on the disk is recorded with almost no reverberation to start with, you can’t back it out. You can add ambient sound, but you can’t remove it easily. BD: I understand there are some gadgets coming where you can actually change tempo, change dynamics, change almost anything, so that you become the conductor in your own living room. MW: That is the case. An interesting trend to consider now is the fact that music can be recorded as numerical data on computer disks which are realized when played at another time. So the sounds are actually created at some later date when that disk is inserted into a machine. A simple case would be the grand piano which can be controlled by a computer. You either encode the data yourself, or you buy the disk, put it into the computer, and then it plays back on the piano in your room or your concert hall. I was shocked years ago to find the complete works of Liszt are available on disks that fit into a Macintosh computer and then get played back. Now, on the internet, the web of webs, there’s a great interest in trading note files. The works of all sorts of composers have been encoded and they’re flying back and forth. People pull them off and play them, probably not with a MIDI’ed grand piano, but probably over some synthesizer which they can control to make it sound like it has symphonic reverberation or small room reverberation. BD: Are you looking forward to your pieces being part of that, or are you recoiling in horror and hoping that they will never get there? MW: It’s really very frightening because we have lost all sorts of control over the way things will turn out. With a compact disk recording or a symphony broadcast or a chamber music performance, you know without question that the cello part will be played on a cello. MW: It seems almost trivial, but once they go through the MIDI chain and go out and come back into someone’s house, even though there have been some standardization of the timbres, there’s still no way of knowing quite how it will sound. What happens is lots of nuance will get chewed up in the process, so it will basically be kind of in-the-ballpark-timbres for some things. I don’t think art music is immediately threatened by this, but there’s a great interest in music among people who are the “Saturday night cruisers” on the information highway, and some of these cruisers are music hobbyists. I think we have a great chance now for the re-emergence of the music hobbyist that probably would have been the sort of person that the publishers would have loved to have sold more editions of Schumann at one time. There were hobbyist pianists, you know; now you have the hobbyist computer music person who transfers files and plays them back on their synthesizers. BD: So this will be the twenty-first century equivalent of Hausmusik? MW: They’re very serious and very charming folks. When asked if they read music, they reply, “Well, no, I don’t really know much about music. What should I do?” They should learn to read music, because at some level, there’s no way around that. But it becomes, I think, a kind of hobbyist enterprise, which is not the worst one you can imagine. BD: Rather than being a composer, then, they become a music manipulator? MW: They would, right, just as folks who would sit around playing the piano four-hands versions of the Brahms symphonies. There was a time when if you wanted to hear the Brahms First Symphony and there wasn’t an orchestra playing near you, the choice was to play it yourself on the piano. There was a kind of great musical development around that sort of amateur involvement. I think that if people are doing anything — whether they’re fiddling with the tempo, say — they’re going to imagine that they’re a conductor, and they’re going to conduct the piece. Or they’re going to maybe noodle with the orchestration. Whatever it is, it’s probably better than simple passive listening. “Better” not so much when one is contemplating a great work of music, but if one is fooling around somehow with music at a amateur or an “applicational” level, it is better to have some involvement than the completely passive process of kind of consuming what’s thrust at you. BD: You mean going to a concert can be too reactionary for people? MW: Oh, I think going to a concert is great. In big cities, of course, that’s the thing to do, and in university towns it’s the thing to do. Once you get out a ways, though, it’s not the easiest thing. And I’m afraid that a lot of popular media teaches people that they don’t want to go to concerts; that somehow they’re uncomfortable places where they might not enjoy themselves. So if this gives another way for people to interact with music, then it might be useful. I think the information highway may offer something down the road, but it’s going to be kind of a funny ride, I think. [Both laugh] I really do! BD: Where is music going these days? Or is this what we have been talking about now for the last forty minutes? MW: Music is this creation of which thousands and thousands of people put a little something into it, and a lot of people take a little something out of it. It changes on its own, so it goes wherever it wants to go, and anyone who tries to stand in its way and make it go a different way is likely to get flattened out by the thing because it’s much bigger than any individual can deal with in terms of its influence. BD: We’ve already lost some of the composers from the sixties and seventies. Are they the ones that have gotten flattened along the way? MW: When I chose that metaphor, I didn’t mean to pick out anyone from a time that had been flattened out, but certainly there are musical ideas that come and go. Playing orchestrations of Bach is not as interesting now as it would have been in Philadelphia under Stokowski. We don’t hear so much of that now with Mr. Sawallisch. BD: Once in a while we get out the old records just to reminisce? BD: ...and he’s pushing eighty! MW: Yes. 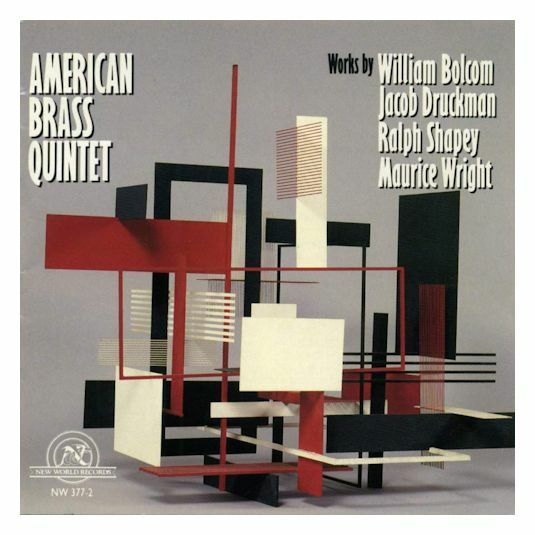 The most recent piece I’ve heard of his is for saxophone and piano called Whirled Series. [Both laugh] So he’s punning more, and the pieces are for me, miraculous to hear! BD: Let me hit you with the great big question. What is the purpose of music? MW: It’s impossible; it can’t do that. However, music does a very good job of expressing things which don’t have any sort of literal flow to them. For example, the beginning of that great, ethereal prelude in Parsifal, where you just have high strings floating away. I don’t know what that means. We should go back to the opera and figure out exactly what the music refers to, but hearing it even out of context, there’s an expression which is not literal; it doesn’t really tell the story. I can’t really explain to you what it’s like, and yet it’s constituting, in a way. It takes a person, a listener, to a certain place that they really can’t get to through a literal or calculating means. BD: Is music then speaking to a sixth or seventh sense? MW: It’s probably speaking to a lot of the subsidiary part of the senses that we have. Because you can’t use music to order pizza doesn’t mean that it’s not a rich mode of communication. It’s just not a primary mode of communicating. The aural sense would have started out initially to help us ward off danger. What’s that sound? Oh, I’m frightened. After speech develops, there’s a kind of an interactional thing that happens. There’s still all the other stuff that the aural sense can do, which has to do with other things other than danger, warning or speech. It’s a subsidiary function; it’s not the primary function of the sense organ, and consequently its development can be much more subtle. It doesn’t need to be as efficient. It can be vaguer; it can be more individual. One person will say, “I heard something in this piece,” and another person will say, “I hate that piece.” Not only novices, but impassioned professional performers will talk about a piece they really love, and another one will say, “That’s the worst masterwork I’ve ever heard. You can’t possibly like that!” [Both laugh] You don’t need unanimity. It’s not like agreeing on what the speed limit should be or what the temperature is. That leaves a lot of room for expression of the other elements, and I think that’s refreshing for humans to work through things from that side. MW: If it’s done right, I think it is. The tedious part of the transcription of the notes is not to be underestimated. There’s this deadly process of writing everything down, and if it weren’t fun, no one would stick to it enough. Unless they’re just absolute masochists, they wouldn’t stick to it enough to get through it. It is enough fun that once things are rolling, one really doesn’t feel the stress of having to line up another bunch of bars; the things that are difficult about it disappear. In great pieces of music, I am able to find things that indicate to me the composer is having fun — things in phrase length, or in musical puns, or in just pleasant phrases that roll off the pieces. So I think that composers have had fun, and when I say fun, it’s perhaps misleading to think that it means that everyone’s a bunch of jokers who come up with clever little jokes. Maybe a better term would be the exhilaration that might come from composing. What must it be like to get a fugue in five or six voices to fit together with the subject and some sort of an intricate inversion and something else going backwards. Think about the key signatures and the notes spelling out names. In Schumann, he’s kind of writing letters, coded messages to everybody in the pieces. Now this by itself, of course, doesn’t make the music any better; whether the fugue has the inversion of the subject someplace in it or not is immaterial. But if it’s a great piece of music and there’s also this great kind of brain stuff underpinning it, you sense that this must have been very rewarding... I almost said a lot of fun! MW: Well! One always pays for opera, as one of the characters in one of my pieces says at one point. It’s great to be involved with opera, and you pay a price. Go to the best restaurant in town. It’s great, and you’ll pay for it! Not everyone can afford the price of either the restaurant or working in the opera. It’s a lot of fun. I’ve written three pieces, two of which have been produced, and each production gets better than the one before. I would like to do another piece probably in the next several years. It’s amazing for me to hear opera singers who come in and are able to memorize the part, to commit the part to memory, and then to be able to do something with characterization. The number of things they have to remember and perform is huge! There was a time in opera staging where you positioned the singer onto their spot onstage, and then they stood and gave what was basically a recital performance, or a concert performance, and you got them off again. When I saw, Götterdämmerung at the Metropolitan Opera in the seventies, Nilsson had just broken her arm and was very nervous about being on the stage. It was that immolation scene where she walked to her spot, and then was led from the stage by a stagehand with a flash light showing her the steps! Today, staging of opera is much more dramatic; anything goes and it can be absolutely wild! It’s becoming very exciting theater in all ways. It’s fun composing opera because you can assume that the convention will be much more of a very theatrical production, and maybe a little bit less of a recital-pose production. One tends to then compose things that will be dramatic. If you see a Peter Sellars production of The Marriage of Figaro, you start to imagine the characters sipping Chivas Regal when the gardener comes in! Once you see it, unless it is absolutely repulsive, I’m tempted to force those things to come up again. I really like opera. I think the tricky thing of opera is knowing that at some point you, the composer retain “complete control,” but the stage director is really the person who has some imagination that lets him or her see what the stage is going to look like; they can imagine where everyone is going to move, and how you get someone on or off. It’s a lot of fun. You make mistakes; I make mistakes. Beeson said that you may as well make your first opera short, because it will never be done and it won’t be very good! So don’t waste too much time on it! In the last piece I did, I had this great idea that the two younger characters in would come together in a quiet moment and sit on a rock. I had written a long duet for the two of them as they were seated down in front of the rest of the set, a very simple setting on a rock. We got to the production, and the budget was ample but it was very tight, and someone had made a decision that since the rock was only called for in one scene and other things were called for in more than one scene, we would do away with the rock in return for a better effect someplace else. So there we were, and there was no rock. The director said, “What do you imagine?” I was complaining that what they were doing looked antic. He said, “What did you want them to do?” I said, “I want them to sit on a rock.” “But there is no rock!” I said, “I still want them to sit on the rock.” You can’t win an argument where you don’t have a rock. [Both laugh] But it’s lots of fun. I would start tomorrow on a piece if I knew I had a year cleared of other things. I need a year off to goof around to do that, but I would do that tomorrow. BD: I look forward to it, when it comes eventually! MW: I do have an idea. It’s going to be on Appalachian myth, things that happen on a mountain at different points in time, from probably the first contact of Europeans with Native Americans, and how they talk about the mountain, and whose it is. There’s a character in the piece who is a trickster, who swindles everybody out of everything. In the next act we’re in the nineteenth century, and John Henry is waging a contest with the steam engine. Our character is there again, placing bets on the whole thing. Then in the twentieth century, I imagine the same mountain as one of those resorts in the Appalachians which has a secret underground place for the Senate to go in the event of some attack. Our character is trying to somehow weasel his way into that, because he knows the astroid’s coming. So I look forward to it! BD: I wish you lots of continued success in your compositional career. MW: I appreciate that. I hope that there’s just enough from time to time to keep everybody convinced that it’s what I ought to be doing. This interview was recorded in Chicago on September 16, 1994. Portions (along with recordings) were used on WNIB one month later, and again in 1999. A copy of the audio tape was placed in the Archive of Contemporary Music at Northwestern University. This transcription was made in 2010 and posted on this website in 2011.